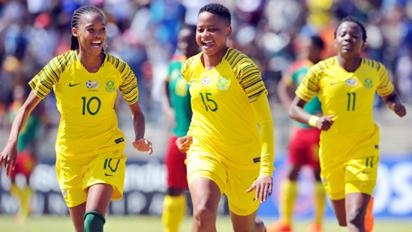 Banyana Banyana forward Jermaine Seoposenwe believes Nigeria will come at them in Saturday’s Africa Women Cup of Nations final to revenge their group stage defeat to the South African national team. “I think it’s going to be a little difficult, specially from the game we played earlier. I think they will go out and take revenge for the loss they took in group stages. If we come to this game as focused as we were from the start we can get the result that we want. We just have to play the brand of football we have been playing. She said winning the title was just one more thing they could add to the great run they have had in this tournament. South Africa sealed an historic first qualification to next year’s World Cup in France when they defeated Mali 2-0 in the semifinals on Tuesday‚ clinching a top-three qualification spot. They also beat Nigeria 1-0 in their opening Group B match, and then trashed Equatorial Guinea 7-1. They drew 1-1 with Zambia in a match that guaranteed them the top spot in their group. The Super Falcons of Nigeria have won the tournament 10 times, while Banyana have only reached the final four times, where they lost against Nigeria twice, in 1995 and 2000. Seoposenwe and goalkeeper Kaylin Swart made history for representing national teams in the World Cup twice. First it was the Under-17 Fifa World Cup team in 2010 and now Banyana at the World Cup in June 2019. She said they matured from the time they were teenagers with the Under-17 team and were now leaders. Banyana have also been nominated in three categories at the Confederation of African Football (CAF) Awards 2018. The captain of the South African senior women’s national team, Janine van Wyk, has been nominated alongside star striker and leading goal scorer at the tournament, Thembi Kgatlana, in the African women’s player of the year categories. Kgatlana has scored five goals in four matches and won three consecutive woman of the match accolades. In another category Banyana are nominated in the CAF women’s national team of the year category, an award they won early this year. The CAF awards ceremony will be held on January 8 2019 in Dakar, Senegal. The 2018 Total Women’s Africa Cup of Nations final will take place on Saturday at the Accra Sports Stadium in Ghana at 6pm South African time. South African Football Association vice-president Ria Ledwaba left the country on Friday to attend the final.